The phrase “Great Transformation” [used by environmentalists] recalls Karl Polanyi’s classic work on the birth of the market economy and the capitalist system, a development contemporary with the Industrial Revolution. That was one of the most profound shifts in all of human history, matched only by the beginnings of agriculture some 12,000 years earlier. And as Polanyi noted, the (first) Great Transformation marked a change not only in human society but in human nature. The work of the next Great Transformation will be to effectively undo all of this, creating a new economy, or human ecology, and a new human nature, all within the next decade or so. A tall order, for which there is no historical precedent, despite Klein’s best efforts at finding one. With all due respect to Annie Leonard, and I am deeply sympathetic to her concerns, her sharing, caring community in downtown Berkeley is not a viable model for a new economic order. It is an enclave, existing within and supported by industrial civilization. As Leonard correctly points out, it was the Industrial Revolution that changed the world and turned our economy into one based on mass production and mass consumption. To change things – either “back” or forward, if there is a difference – means to some extent undoing the Industrial Revolution. Unfortunately, that revolution has turned into what Ronald Wright, in A Short History of Progress, describes as a “progress trap.” There simply is no way out of it because of the sacrifice involved in tearing ourselves free. It’s rare, and usually not a very good idea, for a reviewer to inject personal, biographical information into a review, but in this case I feel it’s warranted. I grew up, and spent a great deal of my life living on a farm. Briefly the house had no plumbing. We used an outhouse. We churned our own butter for years. We baled hay in the summer using small bales that had to be loaded and unloaded by hand. We cleaned out cattle stalls all winter – every day, seven days a week – by pitchfork. Today, I know of very few farmers – aside from the local Mennonites – who live like this. Hay is baled in massive round bales, stalls are cleaned out by automated systems or small tractors. Butter is so cheap there’s no point making your own. Or even, for that matter, growing your own vegetables (as we always did). In other words, a return to a News from Nowhere sort of medievalism. It sounds like the vision of Princess Nekayah [in Samuel Johnsons’s novel Rasselas], and is just as likely to be realized. When Pol Pot wanted to send Cambodians back to the land he had to do it at the point of a bayonet, and even so he ended up killing millions. As I said at the end of my review of Rubin’s book [Jeff Rubin’s Why Your World Is About to Get a Whole Lot Smaller], three things will be needed to respond to the challenge of finding an environmental balance for modern civilization, each of which is a total non-starter politically: real sacrifice, meaning accepting at least some diminishment, and probably quite a lot, in our quality of life; a spirit of radical egalitarianism, meaning we all sacrifice equally; and a global consensus on action, since the problems we face have global ramifications. To say that Leonard is right in pointing out the dangers of not doing anything, of just continuing to live the way we live now, is almost beside the point. We know smoking is bad for you – a major cause of cancer and heart disease – but people still smoke. We know fast food will kill you, but that hasn’t stopped billions of people from eating it. And these are examples where the ill effects of our behaviour are personally and (relatively speaking) immediately felt! The fact of the matter is that we are not a rational species, and we’re even worse when it comes to planning for the future. I wrote that I found much of her book compelling, but indicated that, on several crucial issues, I found it vague. 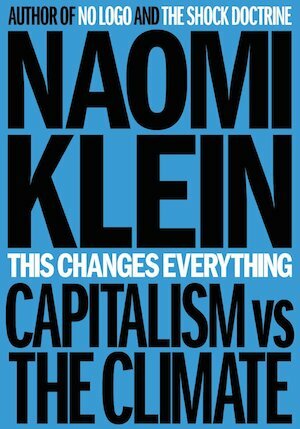 In particular, I wrote that the book glossed over the really significant—and politically unpopular—changes in American life that meaningful climate action requires. Klein’s letter only confirms this assessment. She reiterates a claim she makes in her book that as far as cutting consumption goes, “we would need to return to a lifestyle similar to the one we had in the 1970s, before consumption levels went crazy in the 1980s.” This claim is either purely impressionistic or just plain wrong. If you look at the figures, which, once again, are readily available online, you’ll see that since the 1970s, per capita energy consumption in the US has actually declined, as have per capita emissions. How far back would we have to go to make the kind of difference that’s needed? De Villiers says we can still enjoy the fruits of advanced technology and live “as well as, or perhaps better than, the well-off do now” in a green society. I want to be optimistic, but as you can tell from these review excerpts, I’ve been saying the same thing for years now and haven’t read any evidence to change my mind. We may be on the cusp of a Great Transformation, but it won’t come through planning, or willingly.